JUST IN CASE YOU’VE MISSED OUT ON THE HOUSE FLORALS INTRODUCTION PAGE, THE IDEA OF OUR SEMI-CUSTOM COLLECTIONS IS TO INTRODUCE YOU TO FLORAL ILLUSTRATIONS THAT YOU ARE ABLE TO USE IN A WAY THAT SUITS YOUR STYLE. NOT DICTATING A THEME, LAYOUT OR FONT TO YOU, INSTEAD HERE I’D LIKE TO INTRODUCE YOU TO THE FLOWERS THAT COULD BE THE STARS OF YOUR STATIONERY. TO BE USED AS DETAILED SKETCHES, SILHOUETTES, SIMPLE MODERN OUTLINES, OR EVEN FULLY COLOURED. TO BE A SUBTLE INCLUSION IN YOUR SUITE, OR FOR MAXIMUM IMPACT, RESULTING IN A BESPOKE SET WITHOUT THE HIGH BESPOKE FEE! THIS COLLECTION IS NAMED SIMPLY AFTER ITS SUBJECT - THE GORGEOUS DAVID AUSTIN ROSE.THE ORIGINAL COLOUR OF THIS ROSE SO DELICATE AND FEMININE. IT BLOOMS INITIALLY WITH PINK AND APRICOT TONES AND DEVELOPS INTO A TRULY GORGEOUS PALE BLUSH.THE SHAPE OF THIS ROSE IS SO ROMANTIC, IT‘S PETALS SEEMING TO HAVE AN ORDERED FORMATION, PRODUCING A VERY CLASSIC LOOK. WORK WITH THESE ILLUSTRATIONS IN ANY COLOUR SCHEME TO PRODUCE THE PERFECT INTRODUCTION TO YOUR WEDDING DAY. HERE ARE EXAMPLES OF INTRODUCING COLOUR THROUGH USE OF PIGMENT FOILS AND DIFFERENT TONES AND TEXTURES OF PAPERS. USE ONE, TWO OR ALL THREE ILLUSTRATIONS IN THE SET TO PRODUCE A DESIGN SUITED TO YOUR STYLE. JUST USING ONE ILLUSTRATION CAN CREATE A VERY CLEAN, MODERN LOOK. WHILST THE USE OF ALL THREE CAN PRODUCE A VERY FINE ART FEEL. ESPECIALLY WHEN USED IN DIFFERENT WAYS - THESE ILLUSTRATIONS WORK BEAUTIFULLY WHEN LAYERED WITH YOUR TEXT. 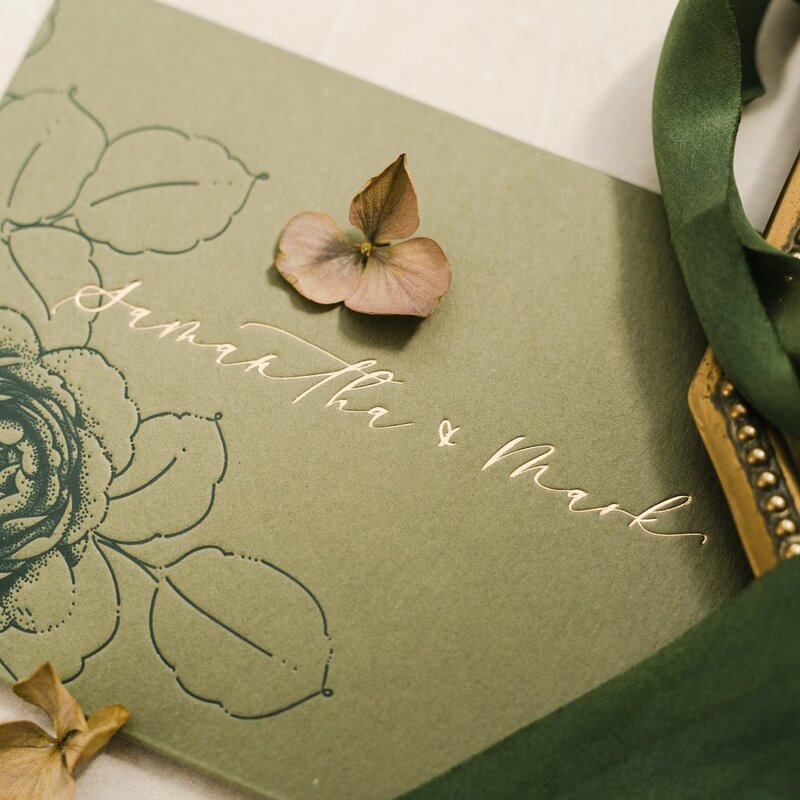 USING DELICATE PRINT, STUNNING PIGMENT FOILS, OR EVEN A BLIND IMPRESSION TO ACHIEVE DEPTH OF INTEREST AND A TRULY TACTILE PIECE; YOUR GUESTS WONT BE ABLE TO RESIST STROKING THEIR FINGERTIPS OVER EACH TEXTURED CARD. THE FINAL LITTLE DETAILS CAN MAKE SUCH AN IMPACT - SUCH AS USING WAX SEALS, FROM A RANGE OF DESIGNS TO A BESPOKE WAX SEAL STAMP, A PERFECT KEEPSAKE WHICH CAN BE USED AGAIN IN THE FUTURE. GORGEOUS RIBBONS, INCLUDING HAND DYED SILK RIBBON, SATIN, ETC; OR PAPER TWINE FOR A CLASSIC FEEL. FOR A TRULY LUXURIOUS INDULGENCE PRESENT THE SUITE IN A GORGEOUS ENVELOPEMENT, YOUR GUESTS WILL PROUDLY HAVE THESE ADORNING THEIR FIREPLACE FOR MONTHS. PRACTICAL AND PRETTY AS EVERYTHING THEY NEED TO KNOW FOR YOUR DAY IS KEPT SAFELY TOGETHER INSIDE.